You are here: Home>Archive>Taylor Brown Collection.>Marriages.>Telegram envelope. 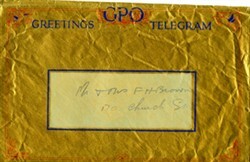 Gold coloured envelope with blue writing ‘GPO Greetings Telegram’. The envelope has red borders and is addressed to Mr. and Mrs. F.H. Brown.